The General Statistics Office announced that the trade gap in May was estimated at US$1.7 billion, the highest since the beginning of 2010. In the first five months, the country imports reached $41.3 billion, up by 29.7% over the same period in 2010. The domestic sector imported $23.7 billion, up by 27.7% over the same period and accounted for 57.4% of the total national imports. The national export value estimated at $7.5 billion, up nearly 1% over the previous month and 18.74% over the same period last year. In the first five months, the total national export turnover reached $34.7 billion, up 32.8% over the same period of 2010. In particular, areas where foreign investments reached more than $19 billion, up by 34.2% over the same period last year, accounting for 54.7% of total national exports. Import turnover in May was estimated at $9.2 billion, up by 3% over the previous months and 28% over the same period last year. The country import turnover reached $6.6 billion in the first five months of the year, an increase of 19% compared to the same period last month. 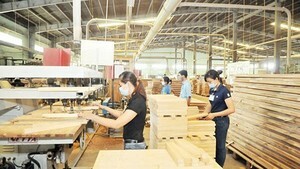 Regarding exports, prices of seafood, mineral, raw materials have increased. Exports in May were mainly textiles, seafood, crude oil, coffee and rice. Import materials are also increasing. The main imports in May were oil, steel and fabric.